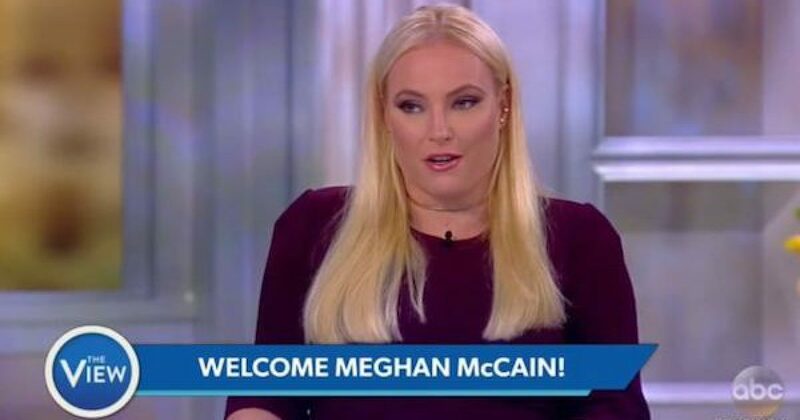 Even though she hates almost everything Republican, Meghan McCain self-identifies as a member of the GOP. It’s hard to think of other people who call themselves Republicans but hate GOP stances and candidates more than Ms. McCain. Perhaps two GOP names that pop into my mind as ranking below McCain in terms of hating Republican positions and candidates are Jennifer Rubin and Ana Navarro. Earlier today McCain battled one of them, Navarro. The View was like a no holds barred match today as Meghan McCain and Ana Navarro got into a heated argument on Monday over the government shutdown and DACA. Liberal host Sunny Hostin blamed the shutdown on Trump, saying he set “this whole thing in motion,” with his order to DACA last September. “The Republicans had eight years to do something about DACA,” she griped. Navarro of course, agreed with Behar, saying that Republicans were playing a political game over this spending bill. “I would say to Mitch McConnell, I would say to everybody because it’s going to happen on both sides, do not play with the people that are defending our national security that are putting our lives at risk,” claimed Navarro. McCain slammed the two reminding them they didn’t make the same claims about Obama and the Democrats when the government was shut down in 2013 and that, “Democrats are playing partisan politics in the exact same way” the GOP did in 2013.